Here at Tathra Beachside we’ve been planting, polishing, painting and promoting all the amazing facilities in our multi award-winning park, and that’s just the P’s! You will find many improvements when you arrive this Summer. There are some things at Tathra Beachside that haven’t changed though – our awesome water park, our kangaroo jumping cushion, our mega adventure playground and most importantly our remarkable staff who keep everything running smoothly to make sure your holiday is the best it can be. And it goes without saying our beaches and waterways are still just as pristine and stunning as ever. So whether you’re spending your Christmas holiday with us this year or planning a visit in 2019, we wish you a fabulous Silly Season and a new year filled with family and fun! Even though our town has been through a rough patch recently, the things you love about Tathra haven’t changed… the beach, the activities, the friendly locals are all still the same. Thankfully our park experienced only very minor damage in the fire, and we are still as dedicated as ever to giving you a truly special holiday on one of the most beautiful stretches of Australian coast. We're also excited to offer some wonderful new accommodation options for all budgets. Check out the ACCOMMODATION tab! So come and experience an award winning holiday! 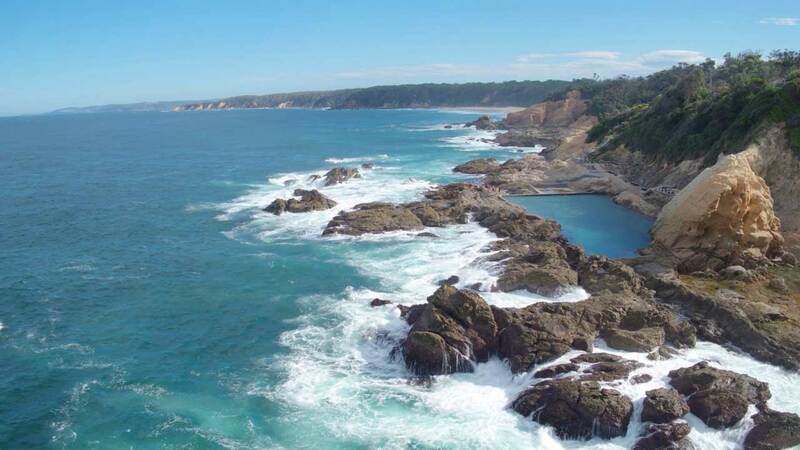 Our multi award winning park boasts over 500 metres of absolute beach frontage, in the pretty seaside town of Tathra on the beautiful Sapphire Coast. This stretch of coast has been recognised as Australia's Coastal Wilderness for its unspoilt landscape and absence of crowds.